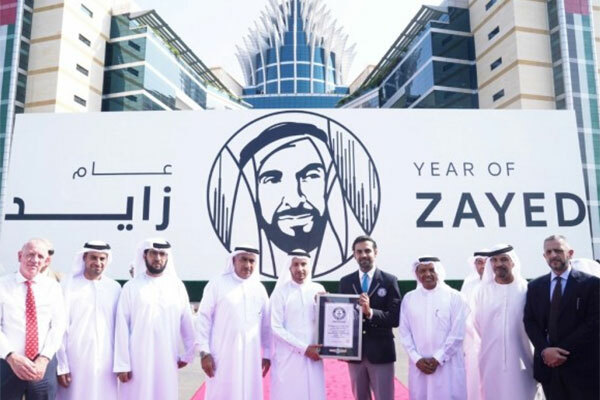 Dubai Silicon Oasis Authority (DSOA), the regulatory authority for Dubai Silicon Oasis (DSO), the integrated free zone technology park, obtained its first-ever Guinness World Records title for the largest wooden block mosaic in the world. The piece, displaying the Year of Zayed logo, was crafted as part of DSOA’s 47th UAE National Day celebrations, reported Emirates news agency Wam. Dr Mohammed Al Zarooni, vice chairman and CEO of DSOA, received the certificate of achievement from Samer Khallouf, Head of the Records Management Team –Mena at Guinness World Records, in the presence of DSOA’s staff, business partners and members of DSO community. Measuring 224.12 sq m (27.56 meters x 8.132 meters) and comprising 22,275 recyclable wooden mosaic blocks, the masterpiece that was completed by 80 people contributing approximately 260 working hours over a period of 20 days is on display across from the DSOA headquarters. Dr Al Zarooni said: "The founding father of the UAE, late Sheikh Zayed bin Sultan Al Nahyan, was a role model for thousands of people in our country and beyond, known for championing patriotic and humanitarian values as well as supporting those in need. It is heart-warming to stand here today to honour the legacy of our founding father and celebrate our beloved nation." He added: "We are thrilled to have earned our first Guinness World Records title, an achievement that will go down in our books as a key success story that pays homage to the glory of our leaders. Through this initiative, we hope to convey to future generations of citizens and residents what an exemplary leader Sheikh Zayed was and how his noble values helped shape the UAE of today." Since the announcement of 2018 as the Year of Zayed by the UAE leadership, DSOA has been hosting a series of initiatives showcasing Sheikh Zayed as one of the world’s greatest leaders and most inspirational figures. DSOA’s calendar of events reiterates its commitment to contributing to the objective of the National Agenda of the UAE Vision 2021 to build a cohesive society that preserves and honours its rich legacy.